Uncle Frank stood his ground at the head of the table, knife in hand, relishing his importance as the annual turkey carver. My Aunt Roberta smiled deviously from behind; her two sisters Myrtle Mae and Loretta supporting her with devilish grins of their own. Frank lifted the tinfoil covering pressing the outline of what appeared to be a rather large bird, slowly at first and then quickly to reveal a small Cornish hen seated in the center of the otherwise empty platter. His mouth flew open but no sound emerged. “Well, I believe we see Frank speechless for the first time in his life,” said my grandfather, who followed the remark with a laugh that vibrated around the room, joining the laughs of others just now getting the joke. My aunts and mother content with knowing they bested the biggest prankster of the family returned to the kitchen and retrieved one of the largest turkeys ever served at one of our annual family gatherings. Years later I have often wondered how long it took those three women to create and pull-off this legendary act that became known in the annals of our family as the “incredible shrinking turkey” prank. 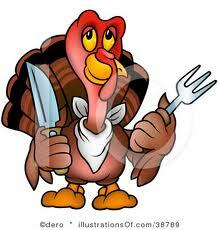 I thought of it again last week as I pulled my Thanksgiving Cornish hen from the oven. This was the first Thanksgiving in years that I stayed home rather than making the drive to Kansas to be with family. I missed the camaraderie much more than the food, but somehow it seemed important to keep the day by preparing at least a couple traditional dishes like mashed potatoes and gravy to pare with my tiny turkey substitute. I drew the line on pumpkin pie since I would need to eat the entire thing myself, but wanting something sweet, I settled on a fruit salad based lightly on a Waldorf salad. It went perfectly with my tiny bird, not too heavy but sweet enough to tickle the tongue if not the funny bone. 1. 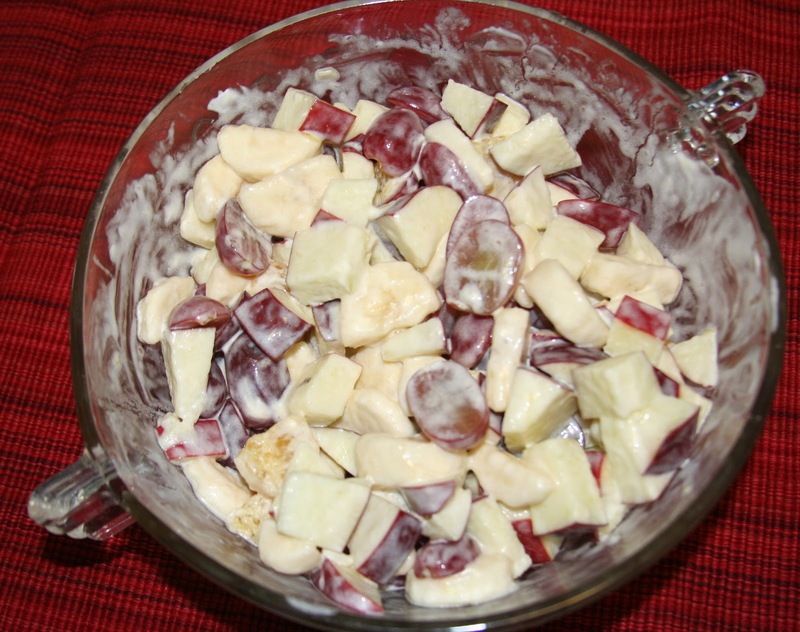 Place apple chunks and banana slices in a small bowl. Squeeze the juice from one of the orange halves over the apple and banana and toss to coat. Remove the peel from the remaining half of the orange, cut into sections and add to the bowl along with the grape halves. 2. Mix the mayonnaise and yogurt together, pour over fruit and mix well. Stir in walnuts if using. Note: This makes three or four servings, but keeps well in the refrigerator for a couple of days. The orange juice keeps the apples and bananas from turning brown.